“Strategy is about choice, which affects outcomes,” according to Wikipedia. Digital Survival for Everyone™ is all about ongoing action plans to help you achieve your goals. Your plans should make the challenge of Success in a Digital World™ easier to understand and achieve. In my last post, I suggested that you map out your own needs and goals to move you along in taking charge of your computer. Because most people learn computers on an ad hoc basis, bits here and there related to a specific task, right from the start you are likely to have more knowledge in some areas than others. If you are going to put in the effort to execute your plan, then keeping your goals right in front of you is an excellent way to stay motivated while you execute your strategy. Take Charge of Your Computer! It’s a great rallying call for a whole lot of people, and I often get the feeling that many go straight to “the devil is in the details.” So in my next few blogs I will address ways to learn about computers with a Take Charge spirit as you make sense of the task at hand. Success in A Digital World™ comes from having a foundation of digital survival strategies for making sense of what you need to know and learn, and the digital survival skills to take care of yourself now and in the future. Digital survival strategies and skills will allow you to solve problems and troubleshoot when you have to and educate yourself when you need or want to. 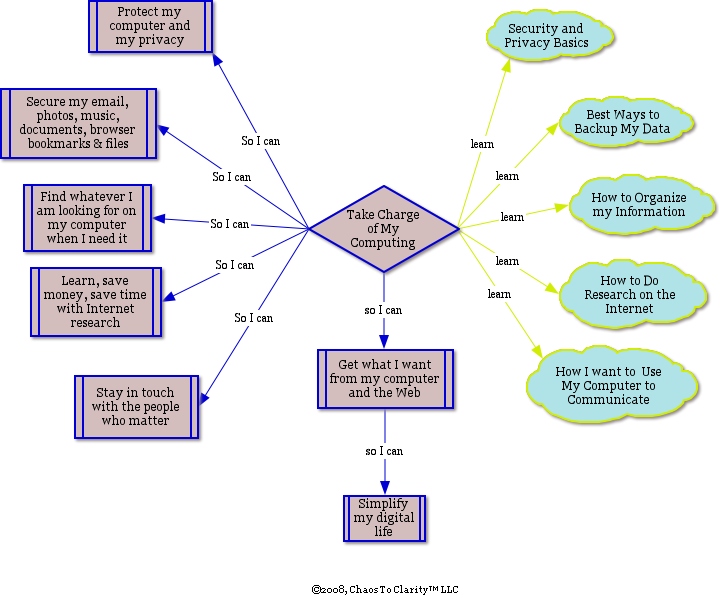 Continue reading Take Charge of Your Computer! One of my favorite ways to keep up with technology (and everything else) is through podcasts. A podcast is an audio or video series that you play on your computer or portable device. Subscribe to individual series with iTunes®, or another program, and when new a show is released, it shows up in iTunes or whatever program you use. It takes no effort on your part to seek it out. Many news radio stations, public radio stations, and TV stations provide podcasts of their shows. Blogs offer you a great way to find out what’s happening in the world of technology. You can view a blog through your Internet browser, or subscribe to a RSS feed using a reader (a feed keeps you up to date on new additions to a blog). The advantage of RSS feeds is that you can subscribe to a blog and when a new entry is posted, it shows up on your computer in your reader program. It takes no effort on your part to seek it out. In addition to blogs, you can subscribe to news feeds from all the major newspapers and magazines and even select which topic areas (Politics, Style, Metro etc.) you want to keep up with regularly. I hate dealing with finances—bookkeeping, accounting, investing, all of it—I’d rather be doing just about anything else, maybe even a root canal. And I’m naturally skeptical of the ability of any big bureaucracy to run anything well. So when Congress started debating a $700-billion taxpayer funded bailout, I wanted to know what the heck was going on despite my distaste for all things financial. The Federal government did a horrible job of explaining the financial crisis so I turned to the Internet. I began by listening to The Giant Pool of Money from This American Life. The episode explained, in plain English, the role that mortgages played in the current financial crisis. They did a second episode, Another Frightening Show About the Economy, which described what happened beyond mortgages to bring the current financial crisis to a head. Internet Explorer® may be the most common Internet browser used, but it isn’t the best. I’ve found that most people use Internet Explorer because it came with their computer, not because they actively chose it. Anyone reading this post that doesn’t use Firefox® should take a look at it. It is more secure than Internet Explorer and there are hundreds of add-ons that allow you to customize Firefox to fit your needs.